Uses Pamela's gluten-Free pancake mix following the recipe on the back of the packaging. Or, just use your favorite gluten-free pancake recipe, stick it in a bag and then in your purse or man-purse, or whatever-bag. 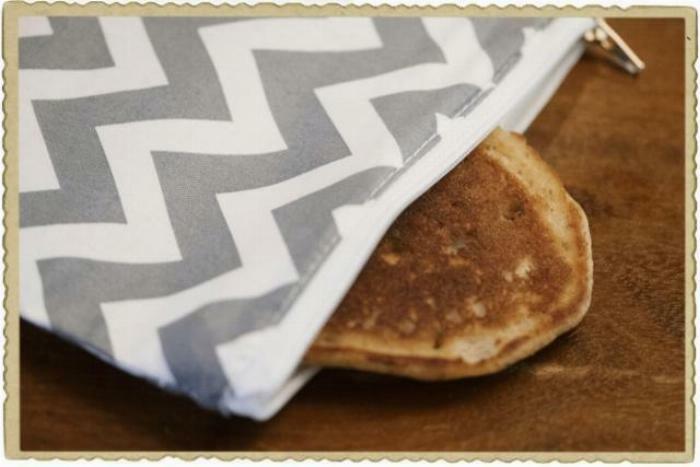 It's the portability aspect that makes these pancakes "Purse Pancakes." This recipe is not dairy or egg free! 1Heat skillet or griddle over medium-high heat. 2Mix all ingredients together in one bowl until mixture is smooth. Adjust thickness of batter. Add more water to make thinner pancakes; leave out water for thicker pancakes. 3When skillet is hot add your choice of cooking oil, butter, or margarine. 4Pour batter so it spreads to about a 4-inch pancake. Pour as many as will fill the skillet with room to flip pancakes. When the top begins to dry and bubbles form and pop and edges turn up looking dry flip the pancake. It should look golden-brown. If it is darker than golden brown, lower the heat. If the bottom of the pancake browns before the top of the pancake begins to dry or make bubbles the heat is too high, and the pancake will splatter when you try to flip it. 6Place in food-safe bag and then place in purse (bag). GO!